Elephant family – I love you but I wish that you had loved me back. 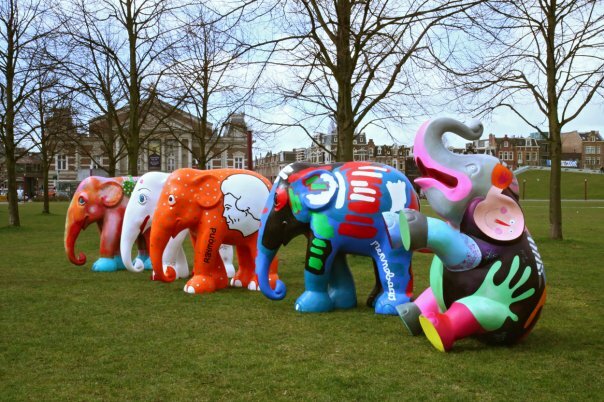 250 elephants are parading the streets and parks of London right now! Bought to you by the Elephant Family these beautiful and original elephants will be making London’s streets a more colourful and interesting place until July 2010. Each elephant is decorated by a different artist or celebrity. Its simple, eye-catching, inspiring and a logistical miracle. There are elephant walking routes and maps and a brilliant Facebook fan page with over 7000 fans and hundreds of photos of peoples favourite elephants. The elephants get auctioned on 3 July and in the meantime you can buy miniature ones in Selfridges or go to the elephant parade online shop. Its London’s biggest ever outdoor art event and it aims to raise £2 million for the Asian elephant as well as benefiting 20 UK conservation charities. I was walking in London last weekend and was inspired by an elephant at City Hall, which had clear bubbles on its skin. When you looked inside you could see lots of miniature elephants in a miniature city landscape, and at that point I had no choice but to text to donate. Although I work for a charity, I’m still just about the most cynical person alive. So this feeling of inspiration and taking an action is a very rare thing for me indeed. I texted elephant to 83118 and got a message by return saying thank you and that someone would give me a call within 48 hours. I felt a bit sad that there wasn’t someone at the other end of the phone to indulge me in my excitement – but I’m an adult. So I got over it. That was last Saturday. Still no call. Yesterday (6 days later) I got a text message to apologise for the delay and that I would honestly get a call soon-ish. But it’s too late, I’ve lost my childish excitement and the cynic is back in place once more. I love the elephants. I was desperate to be part of the Elephant Family experience that day. I hope that the lack of a follow-up call is because they have been overwhelmed and this project is raising huge amounts of money for a range of great causes. I’m sad though because that feeling of excitement and connection that I felt when I sent my text from the City Hall bubble miniature elephant has gone. If I had received a call that day the donation I would have given would have been greater, and more importantly the experience I would have had as a donor would have been much richer than the experience I will have from receiving the call that I may – or may not – get over the next few days. This entry was posted in customer service, fundraising, Innovation, Inspiration, Uncategorized and tagged asian elephants, auction, charity, conservation, donation, elephant, elephant family, facebook, fundraising, london, text to donate. Bookmark the permalink.